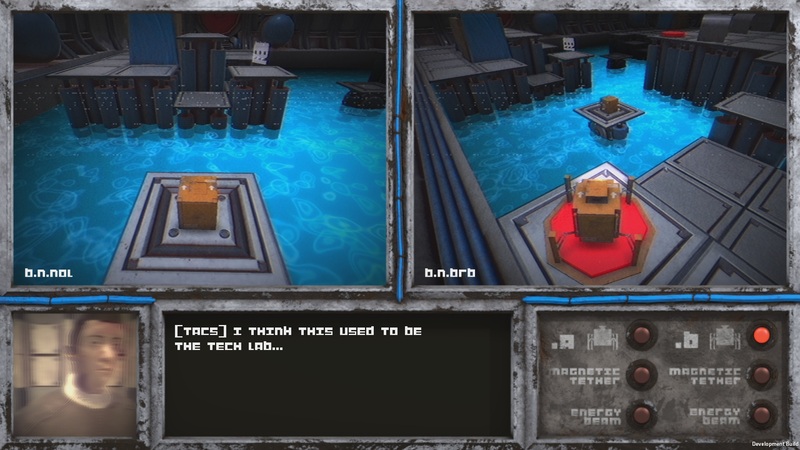 Factotum 90 is a puzzle game developed and published by TACS Games. You’re flying through space in some sort of ship when suddenly, something collides with the ship and throws a bunch of its systems out of whack. 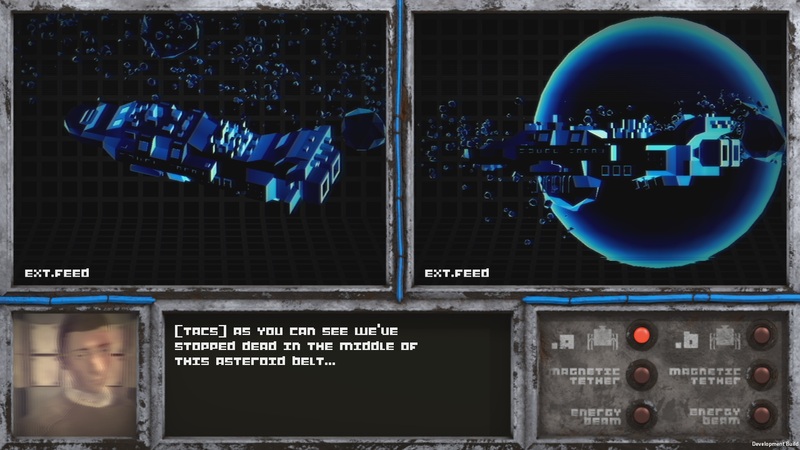 Fortunately, you have access to these little robots that you can use to navigate through the ship. Hopefully while clambering through the ship, you can fix some of it’s problems, and find out what happened. The big gimmick of this game is that you control two robots independent of each other. Utilizing these guys, you must get to the end of every level, of which there are 30. Of course, you’ll need to traverse some obstacles in each level. The most basic puzzles involve standing on a button with one robot to lower a platform, and traversing it with another robot. From there, the game adds on more and more layers with new puzzle elements. 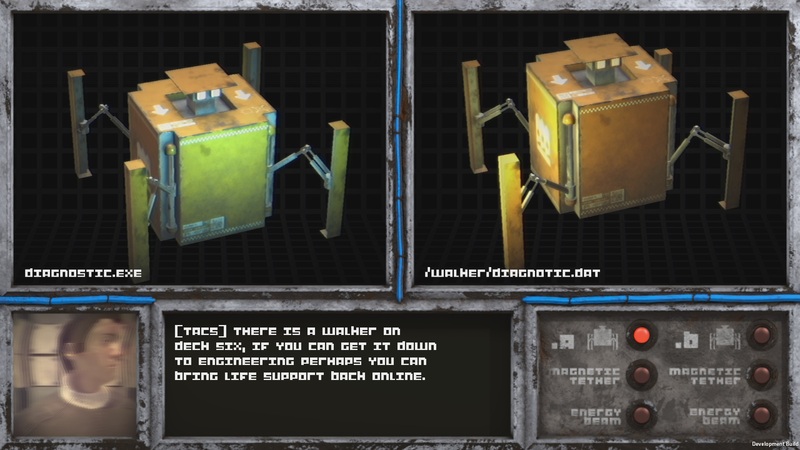 There are basic things like using boxes to depress buttons or bombs to remove obstacles. Then, there are trickier elements like redirecting lasers using your robots. The game has a pretty good difficulty curve, though I don’t think the game ever gets all that tricky. Puzzles don’t really get more complicated so much as they just ask you to do more and more things, or figure out the right order to do things in. If you break even later puzzles down, most of what you’re doing is still the same button puzzle you were doing at the beginning of the game. One obstacle feels almost pointless. It’s a force field that you have to disable by interacting with a panel. Only, this panel is almost always just right next to the force field, so why have it there at all? I think only one or two levels towards the end actually did something interesting with it. I suppose that’s the biggest issue this game has, the obstacles are all really simple. The individual puzzle elements never really get more complex after they’re introduced. Many great puzzle games use fairly simple mechanics to build more and more complex puzzles, but this game doesn’t really succeed in that area. I can’t say I ever felt stumped by any levels, or had to really think about them. You get through one obstacle, see where that takes you, solve that next one, repeat. It’s like solving a really long equation. It’s a lot of work and can look hard at first, but each step is just basic stuff you already know how to do. There is still a bit of satisfaction and enjoyment. Beating each level does feel good, though you never really get that thrill of finally figuring something out that you might get in other puzzle games. There aren’t any real technical problems, and each mechanic works as intended. There’s also a bit of extra challenge in each stage in the form of a collectible that usually requires a little bit of thinking to get. My only two issues are that your robots walk very slow, and switching between controlling one or the other takes a second or two, for no real reason. Visually, the game looks decent enough. Factotum 90 does have an interesting presentation. 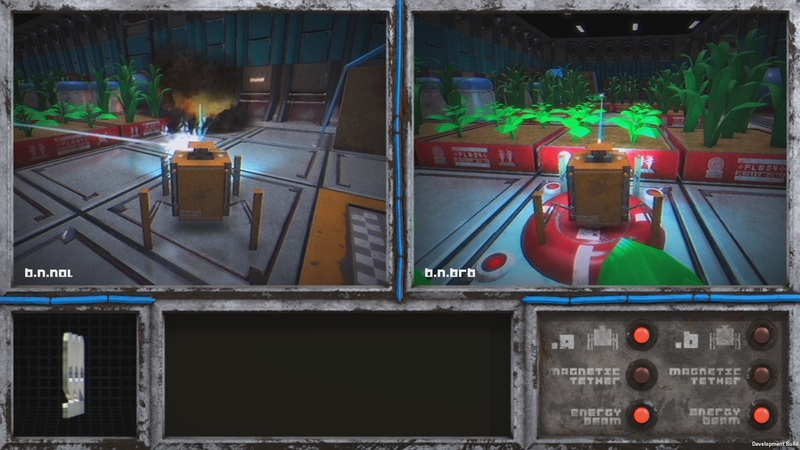 In the game, you’re just a guy controlling these robots from a computer, and the interface is actually set up to look like that. It may be a bit weird at first, since the actual game screen is so small, but I didn’t mind it after a while. The music is good too, with some soft electronic sounds that aren’t distracting. The sound design is also competent; nothing sounds bad, though I don’t think any of it was particularly notable. This is a hard game to recommend. It doesn’t do anything egregiously wrong, but I feel like anyone that wants really challenging puzzles won’t find them here. At the same time, I don’t think this will be appealing to those that aren’t into puzzle games. The silver lining here is that the game is really cheap, only $5.99. It’s also pretty short, only maybe three or four hours, depending on if you get stuck or not. If you’re curious, maybe give it a go, but have some tempered expectations.